Apple iPhone 8 to have 512GB variant, Samsung Galaxy Note 8 and iPhone 8 side by side comparison. Apple is all set to launch all new iPhone 8 this fall as the days are nearing toward the launch, we are flooded with back to back leaks. Now we have some new leaks which claim that the next iPhone 8 will have storage variants up to 512GB. As per the latest leaks, the upcoming Apple iPhone 8 to come in three storage options with 64GB, 256GB, and 512GB storage options.All the three variants will have 3GB RAM and will be powered by Apple A11 Chip.So the storage options of the iPhone 8 are doubled the storage option of earlier launched iPhone 7. 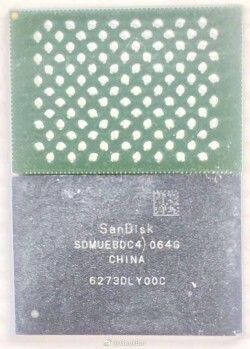 We also got the leaked image from China of the 64GB storage chip made by SanDisk.As per leaks, the 64GB and 256 GB storage chips are made by SanDisk and Toshiba while the 256GB chips are made by Samsung and Hynix. 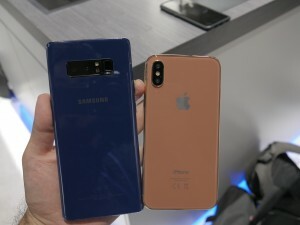 Apart from that we now have images which show the Samsung Galaxy Note 8 been compared with dummy unit of the Apple iPhone 8.After numerous CAD renders of the iPhone 8 now we have the dummy unit again been compared with the recently launched Samsung Galaxy Note 8 by GSMArena. 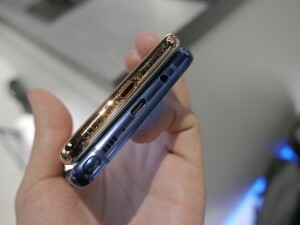 As per GSMArena, Apple iPhone 8 is just 7.5 mm thick whereas the Samsung Galaxy Note 8 is 8.6 mm thick. 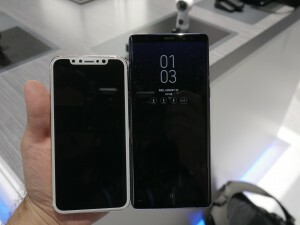 Samsung Galaxy Note 8 is also wider and larger than the iPhone 8 from the above images.At the front, we can see the cut out for the IRIS scanner and front-facing camera with the earpiece in between of the iPhone 8. 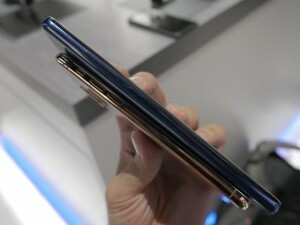 At the back, we have the vertically aligned Dual camera setup with Dual LED flash in between on iPhone 8 where as horizontally aligned Dual camera setup with dual LED flash, heart rate sensor and fingerprint scanner beside it on Samsung Galaxy Note 8. At the bottom, we can find the lightning port and speaker mesh on the iPhone 8 and USB Type-C port with S-Pen slot, 3.5 mm audio port and speaker mesh on Samsung Galaxy Note 8. Apple iPhone 8 launch date. Previous articleSamsung Galaxy J7+ with Dual camera Setup spotted Online. Next articleSamsung launches the Samsung Galaxy Note 8 will go on pre-orders staring Sept 11 in India. Apple to launch two new AirPods later this year, will have all-new design.